Not all people that take NSAIDs or with H pylori infection develop ulcers. Peptic ulcers do not always cause symptoms. Symptoms may come and go. Food may increase gastric ulcer pain. 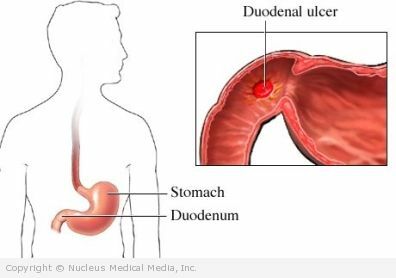 Food will often relieve duodenal ulcer pain. The doctor will ask about your symptoms and medical history. A physical exam will be done. Tell your doctor about all medication you are taking. The goal is to remove the source of the problem and heal the ulcer. Gastric ulcers may take longer to heal. Some medications block or reduce acid production. Some coat the ulcer to protect it. If H pylori caused the ulcer, you will need to take a combination of drugs to kill the bacteria. This usually consists of antibiotics and a proton-pump inhibitor. It is very important to take these drugs as directed. The doctor may order tests 6-12 months after treatment. This is done to check that the bacteria are gone. If you smoke, quit. Smoking interferes with ulcer healing. Avoid NSAIDS. This includes over-the-counter drugs like aspirin and ibuprofen. Spicy or fatty foods may worsen symptoms. You can temporarily stop eating them. Keep in mind they did not cause the ulcer. They probably do not affect ulcer healing. If stress increases ulcer pain, learn and practice stress-management techniques. Highly elective vagotomy — This is a technique that cuts only part of the vagus nerve. This surgery does not require extra drainage. Vagotomy with antrectomy — This involves cutting the vagus nerve combined with removing the lower part of the stomach (antrum). The antrum makes a chemical that promotes acid production. Without that chemical, acid production drops. This may be done to stop bleeding. 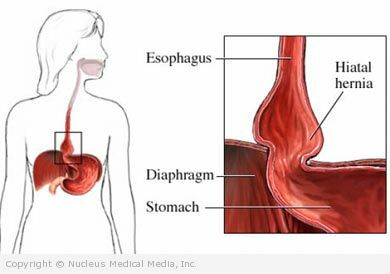 A thin, lighted tube is inserted down the throat into the stomach or intestine. Then, heat, electricity, epinephrine, or a substance called “fibrin glue” can be applied to the area. This should stop the blood flow. Don’t smoke. Cigarette smoking increases the chances of getting an ulcer. Ask your doctor about switching to a newer NSAID. Look for one that is less likely to cause ulcers. Talk to your doctor about taking other drugs to protect your stomach and intestine lining.